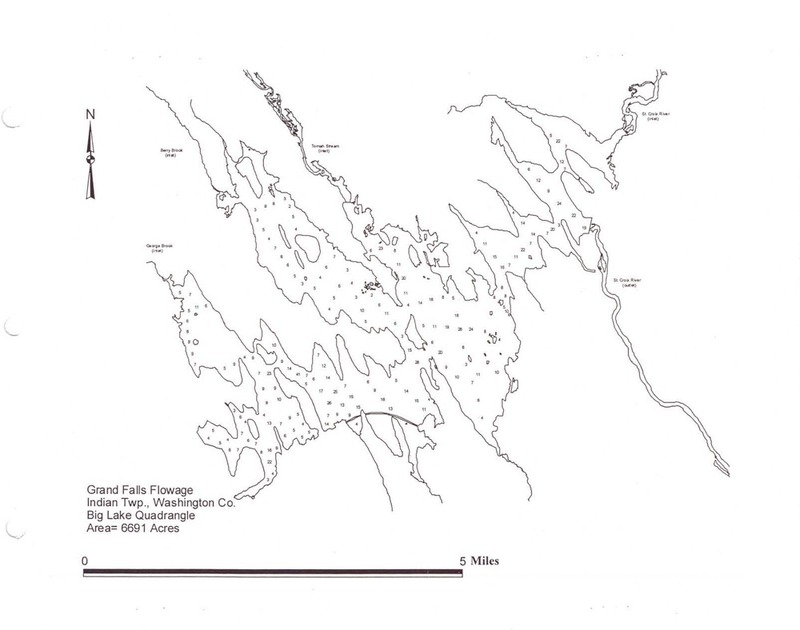 The arrow in the photo above marks the location of Down River Camps on the Grand Falls Flowage (Click images on the right for more references). As you can see, the log booming was....well booming! The large building you see in the first picture is a saw mill. The logs would be boomed to this small cove, where the mill would haul them up and process them. They would cut the logs to length and stack them on either side of the dirt road that acted as our driveway. When our family moved here in 1978, the mill was still there, although production was slowing down and the log booming was dying out. Until that time however, the small town of Princeton was built on loggers, water and lumber. This went on to create one of the best smallmouth bass areas you could imagine. Here is a little more about the logging industry and its impact on the area. Long logs, and later pulpwood, were harvested in the remote forests upstream from Princeton. Lumberjacks used teams of horses to haul the wood to the ice and on the shore, where it remained until spring. These men worked all the hours of daylight and at times didn't receive any cash until the logs were at the mill "below." Sometimes instead of cash they were given credit at the company store. Streams, lakes and rivers were the standard means of transporting the logs. Using spring runoff and a series of dams to hold the water until needed, the logs were sent into the water and floated downstream to the awaiting mills. Near the point of entry into the waters of a lake, the logs were gathered by a series of logs chained end to end into "boom logs." The boom logs were used in the small lakes to channel the wood, or they were attached to boats that hauled the logs to the outlet where the rushing waters, aided by skilled men called river drivers rushed the logs to the next lake where they were gathered again by boom logs. Around the turn of the 20th century, railroad was the only means of getting anything in or out of the area. The town decided to tear up the railroad tracks, install a Hydro Dam and flood the entire 10,000 Acre West Branch of the St. Croix river. This area was essentially a standing forest. They did not clear anything, they just flooded everything. The railroad bed is still there in some regard if you know where to look. During the Civil War in 1864, the mills in Princeton suffered a string of fires, devastating many of the mills and bringing income almost to a halt. The town attempted to recover, but was again struck by fires in 1876. There was much debate about what caused the fire and laments about not having employed night watchmen after the first fire. In 1930 the last major lumber mill in Princeton was built on the Grand Falls Flowage by Ally M. Nason of Monticello. It burned in 1941 and was immediately rebuilt. It burned a second time and was rebuilt again. This is the mill in the above pictures. At one point, the Flowage was used for massive log booms for many years. Many of these logs sunk, adding to the plethora of sunken trees. The saw mill continued to operate in a limited capacity even after they stopped transporting logs by water. All that remains of the big industry are sunken landmarks and overgrown structures that can still be seen if you know where to look.